Name Variation Henry Werdel was also known as Heinrich. Name Variation Henry Werdel was also known as Werdle. Henry Werdel was born on 9 March 1900 at Rock, Cherokee, Iowa, also reported as 09 Mar 1901. He was the son of John Werdel and Gertrude Heller. Henry Werdel died before 1905. [S245] U.S. Federal Census 1900 U.S. Federal Census, by Ancestry.com, ED21. Dwelling 182. Name Variation Victor Arendt was also known as Arndt. Victor Arendt was born in December 1853 at Wisconsin. He married Maggie Benner circa 1880. Victor Arendt died after 1930. 1 January 1925 St. Anthony's Home for the Aged, Dubuque, Dubuque, Iowa He appeared on the census of 1 January 1925 at St. Anthony's Home for the Aged, Dubuque, Dubuque, Iowa. [S245] U.S. Federal Census 1900 U.S. Federal Census, by Ancestry.com, Year: 1900; Census Place: Amherst, Cherokee, Iowa; Roll: 423; Page: 8A; Enumeration District: 0014; FHL microfilm: 1240423. [S250] U.S. Federal Census 1930 U.S. Federal Census, by Ancestry.com, Year: 1930; Census Place: Julien, Dubuque, Iowa; Roll: 653; Page: 20A; Enumeration District: 0020; Image: 935.0; FHL microfilm: 2340388. Married Name circa 1880 As of circa 1880,her married name was Arndt. Married Name circa 1880 As of circa 1880,her married name was Arendt. Maggie Benner was born in February 1857 at Wisconsin. She married Victor Arendt circa 1880. Maggie Benner died before 1925. Maggie Benner had 2 with 2 living in 1900 children. Peter Kohns was born in March 1855 at Iowa. He married Josephine S. Ament circa 1878 at Iowa. Peter Kohns died before 1925. [S246] U.S. Federal Census 1880 U.S. Federal Census, by Ancestry.com, NA Film Number T9-0337 Page Number 39B. [S243] U.S. Federal Census 1920 U.S. Federal Census, by Ancestry.com, ED29. Dwelling 74. Name Variation Josephine S. Ament was also known as Arient. Married Name circa 1878 As of circa 1878,her married name was Kohns. Josephine S. Ament was born in July 1857 at Pennsylvania also reported as New York. She married Peter Kohns circa 1878 at Iowa. Josephine S. Ament died after 1930. Josephine S. Ament had 5 with 3 living in 1900 children. She had 5 with 3 living in 1910 children. Paul J. Kohns was born circa 1911 at Iowa. He was the son of Peter Paul Kohns and Elizabeth Heller. [S250] U.S. Federal Census 1930 U.S. Federal Census, by Ancestry.com, ED21. Dwelling 90. Josephine A. Kohns was born circa 1915 at Iowa. She was the daughter of Peter Paul Kohns and Elizabeth Heller. Name Variation Clara Werdel was also known as Werdle. Clara Werdel was born circa 1904 at Iowa. She was the daughter of John Werdel and Gertrude Heller. Omer J. Niblick was born circa 1896 at Indiana. He was the son of Daniel Niblick and Mary Eiting. Omer J. Niblick married Anna E. Werdel, daughter of John Werdel and Gertrude Heller, circa 1915. 1 January 1925 Cherokee, Iowa Omer J. Niblick appeared on the census of 1 January 1925 in the household of John Werdel at Cherokee, Iowa. Name Variation Mary Dolores Niblick was also known as Dolores. Mary Dolores Niblick was born circa 1916 at Iowa. She was the daughter of Omer J. Niblick and Anna E. Werdel. 1 January 1925 Cherokee, Iowa Mary Dolores Niblick appeared on the census of 1 January 1925 in the household of John Werdel at Cherokee, Iowa. Edward F. Kelliker married Mary Werdel, daughter of John Werdel and Gertrude Heller. Edward F. Kelliker was born circa 1895 at Michigan. He was the son of James Kelliker and Bessie LeBean. 1 January 1925 Cherokee, Iowa Edward F. Kelliker appeared on the census of 1 January 1925 in the household of John Werdel at Cherokee, Iowa. James Kelliker married Bessie LeBean at Michigan. James Kelliker was born circa 1872 at Canada. Married Name Her married name was Kelliker. Bessie LeBean married James Kelliker at Michigan. Bessie LeBean was born circa 1880 at Michigan. Daniel Niblick married Mary Eiting at Indiana. Daniel Niblick was born circa 1880 at Indiana. Married Name Her married name was Niblick. Mary Eiting married Daniel Niblick at Indiana. Mary Eiting was born at Indiana. Name Variation Matilda G. Rupp was also known as Tilda. Matilda G. Rupp was born in December 1890 at Iowa. She was the daughter of Frank A. Rupp and Susannah Fisch. As of 1954, Matilda G. Rupp was never married. 1 January 1925 Cherokee Ward 1, Cherokee, Iowa Matilda G. Rupp appeared on the census of 1 January 1925 in the household of Frank A. Rupp at Cherokee Ward 1, Cherokee, Iowa. [S245] U.S. Federal Census 1900 U.S. Federal Census, by Ancestry.com, ED21. Dwelling 171. Clara A. Rupp was born in February 1894 at Iowa. As of 1954, Clara A. Rupp was never married. 1 January 1925 Cherokee Ward 1, Cherokee, Iowa Clara A. Rupp appeared on the census of 1 January 1925 in the household of Frank A. Rupp at Cherokee Ward 1, Cherokee, Iowa. John H. Rupp married Anna M. Kohn, daughter of Peter Kohn and Elizabeth Fisher. John H. Rupp was born in September 1886 at Iowa. He was the son of Frank A. Rupp and Susannah Fisch. John H. Rupp died after 1954. Name Variation Anna Rupp was also known as Annie. Married Name before 1919 As of before 1919,her married name was Niewold. Anna Rupp was born in November 1888 at Iowa. Anna Rupp married Frank Niewold, son of (?) Niewold and Catherine Selting, before 1919. Anna Rupp died after 1954. Name Variation Frederick Nicholas Rupp was also known as Freddie. Frederick Nicholas Rupp was born on 12 December 1891 at Rock, Cherokee, Iowa, also reported as Dec 1892. Frederick Nicholas Rupp married Mathilda Wilberding, daughter of Anton Wilberding, on 20 April 1915 at Remsen, Iowa. Frederick Nicholas Rupp died on 26 September 1954 at Cherokee, Iowa, at age 62 Frederick Nicholas Rupp obituary. Albert Rupp was born in April 1897 at Iowa. Albert Rupp died after 1954. Name Variation John Fisch was also known as Fish. John Fisch married Anna Diedrich. John Fisch was born circa 1836 at Prussia. [S247] U.S. Federal Census 1870 U.S. Federal Census, by Ancestry.com, Dwelling 132. [S246] U.S. Federal Census 1880 U.S. Federal Census, by Ancestry.com, NA Film Number T9-0332 Page Number 25A. Married Name Her married name was Fisch. Anna Diedrich married John Fisch. Anna Diedrich was born circa 1837 at Prussia. Name Variation Nicholas Fisch was also known as Fish. Nicholas Fisch was born circa 1863 at Wisconsin. He was the son of John Fisch and Anna Diedrich. Name Variation Anna Fisch was also known as Annie. Name Variation Anna Fisch was also known as Fish. Anna Fisch was born circa 1868 at Wisconsin. She was the daughter of John Fisch and Anna Diedrich. Name Variation Lawrence Joseph Kohns was also known as Laurence Joseph. Lawrence Joseph Kohns married Catherine Eischen, daughter of John Eischen Sr. and Margaret George. Lawrence Joseph Kohns was born on 12 December 1899 at Sheridan, Cherokee, Iowa. Lawrence Joseph Kohns died in December 1983. Lawrence Joseph Kohns obtained US Social Security Card at Iowa; last residence Cherokee, Cherokee, Iowa. On 12 September 1918 at World War I Draft Registration, Cherokee, Iowa. Name Variation Catherine Eischen was also known as Katherine. Name Variation Catherine Eischen was also known as Kathryn. Name Variation Catherine Eischen was also known as Katie M.
Married Name Her married name was Kohns. Catherine Eischen married Lawrence Joseph Kohns, son of Peter Paul Kohns and Elizabeth Heller. Catherine Eischen was born circa 1902 at Iowa. Catherine Eischen died before March 2012. 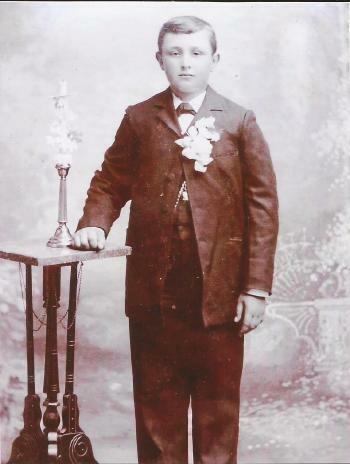 John Eischen Sr. was born in August 1872 at Germany or Luxemburg. He married Margaret George, daughter of Mathias Bernard George and Katherine Kohn, circa 1899. John Eischen Sr. died after April 1930. 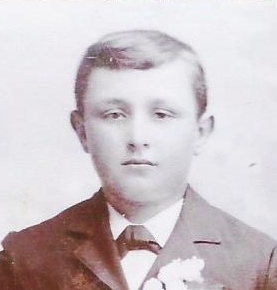 John Eischen Sr. immigrated in 1897. [S245] U.S. Federal Census 1900 U.S. Federal Census, by Ancestry.com, ED21. Dwelling 162. Name Variation Margaret George was also known as Maggie. Married Name circa 1899 As of circa 1899,her married name was Eischen. Margaret George was born in November 1876 at Iowa. Margaret George married John Eischen Sr. circa 1899. Margaret George died after April 1930. Children of Margaret George and John Eischen Sr.
Name Variation Marie J. Kohns was also known as Maria. Marie J. Kohns was born on 12 January 1907 at Sheridan, Cherokee, Iowa.